If you just read the title and said “Ew”, I’m not surprised. I thought the same thing when my sister introduced this to me at age 16, while I was visiting her at college. I have always been an adventurous eater (Except as a young kid. My God, what kid doesn’t like sandwiches?! ), but the thought of roasted cabbage sickened me. I mean, sure make it into coleslaw or add it to a soup, but roasted cabbage?! Ick. Well, true to my “I’ll try almost anything” attitude and since I was on a personal mission to make vegetables taste good, I gave it a try. Much to my surprise, roasted cabbage was so full of flavor, I actually thought someone had added MSG to it. She swore it only had olive oil, salt and pepper, but how did it taste so buttery without any butter? I probably ate a quarter of a head of cabbage that night (I don’t recommend that, by the way). 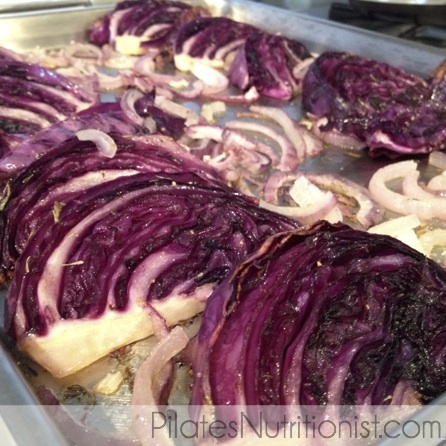 Now with that introduction, I hope you’ll give this roasted purple cabbage recipe a try. Do you have to use purple cabbage? No. It doesn’t change the flavor at all. But roasted purple cabbage is prettier and higher in antioxidants, so if you like the visual and some nutritional bonus points, go for it. Remove outer cabbage leaves, if bruised or tough. 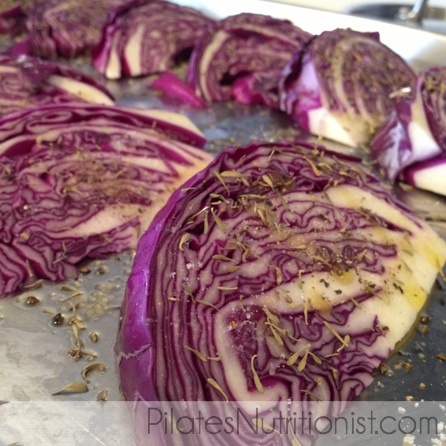 Cut cabbage in half (be sure to cut down the center, so you bisect the stem). Then cut into 8-12 wedges, leaving a bit of stem with each wedge. This holds it together while baking, but otherwise isn’t important. Place on large baking sheet. Season and coat with oil. Roast at 425 degrees for 35-45 minutes, flipping half way through. It’s done when the cabbage is very easily pierced with a fork and lightly browned on the edges. Some of the outer leaves may dry out. Toss ’em if they burn. Roasted purple cabbage makes a colorful addition to your main course and pairs especially well with BBQ, kind of like coleslaw. If you liked this recipe, be sure to sign up for email updates below and get more like it emailed to you every Tuesday. Let me know how it comes out, Veronique! I’m a big fan of red cabbage, its my favorite 🙂 Nice recipe! I was just asked about cabbage recipes, and i will forward this to my friend. I suggested shredded cabbage in a salad (specifically Gado Gado, a traditional Indonesian salad that I love, with a spicy peanut sauce dressing) and I love it as a filling in spring rolls.. but this is so easy. Wonderful recipe, thanks for sharing! Perfect timing, Robin! That Indonesian salad sounds really yummy too. I love all types of slaw! Great recipe, I love cabbage and I’m always looking for new ways to eat it. This is simple and easy for a busy WAHM. I’m going to share it with my peeps! I’m all about simple, Krystal. Enjoy! I want to try this!!! I love cabbage but never thought to cook purple cabbage. In salads, yes, but cooking it… must try. Good receipe. I usually sauté with butter in a pan with more or less the same seasonings. Why have I never thought about roasting cabbage? Many members of the Brassica Oleracea family are delicious when roasted, including cauliflower, kale, broccoli & brussels sprouts. All the brassicas are DE-licious when roasted! Enjoy! Sign me up! 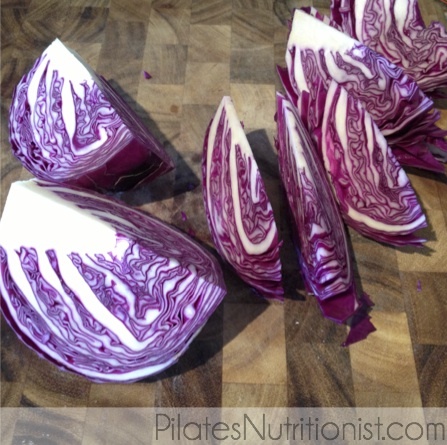 Love red cabbage ? ?